What’s the purpose of that little intro? To let you know that I’ll be talking about ponds. Just kidding. Not to say that I won’t be talking about them. I will. Again and a lot. Now, this post is about a new acquisition of mine. You see, I have this pond, as you may know, but I feel like I wasn’t enjoying it to its fullest. I did have a nice little gazebo where I like to drink my tea and look at my pond and also a basalt bench that looks really cool in my garden, but isn’t the softest seat for relaxing for long hours. Then it hit me. I needed a hammock. What better way to enjoy the pond than to sway gently in the breeze in a hammock strung between two trees? I didn’t know anything about hammocks. I knew I would buy them online, because I buy everything online. And it turns out, there quite a few specialty hammock stores online. So I looked at a bunch of them and actually changed my mind about the hammock thing. One store had these things called hanging pods or hanging chairs. They are like hammocks, but slightly different in that they are more upright. 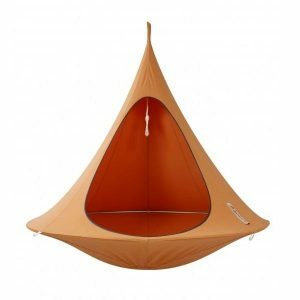 I know I’m not explaining it well, so go check them out here: this is the cacoon double hanging pod. It is the one I bought. It has space for two people and is much more comfortable with two then it would be sharing a normal hammock. Those are great too, but these hanging pods are something new and something different. I really like this thing. There are actually versions without the top part. Basically they are just the bottom foot or so of material and then the rest is open. This is cool in that you have a much greater view of the world around you, but what I don’t like about it as much is it you can’t sit in it when it rains, unless you get some kind of cover above you. The cocoon double hammock chair that I bought has a waterproof cover that lets you sit in it even if it is raining. That way you can hear the rain hit the fabric above you and look at the bad weather outside, while sitting all snug and cozy inside your hammock chair/hanging pod and sipping on that hot cup of tea. This is pure bliss and I now have discovered the best way ever to enjoy my pond. So if you have your own pond and you haven’t found the the perfect way to enjoy it, give a hanging chair a try. Or a hammock if you prefer. 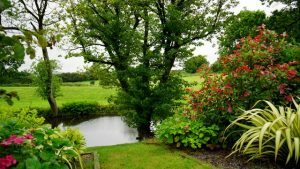 Both would be great options as they are both ultra-relaxing and that is really the most important thing when you are gazing out at your garden and at your pond and sipping on your tea. You just want to relax. You just want the stress to melt away. And few things do that like a hammock. Or, as it turns out, a hanging pod.